Immunohistochemical staining with this antibody resulted in negative staining on mouse spleen. For a positive control human tonsil was immunostained and positive. Additionally cytospins were tested - Raji cells (human B lymphocyte cell line) were positive while A20 cells (mouse B lymphocyte cell line) were negative. 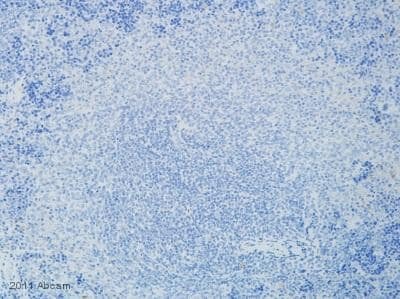 The staining indicates that the antibody does not recognize murine CD20. Thank you for your valuable review. To our knowledge, the antibody has not been tested on mouse samples before. There are several amino acid mis-matches between the immunogen, derived from the human CD20 C-terminus, and the homologous mouse sequence, and this likely accounts for the lack of reactivity with your samples. (The same reviewer also provided data demonstrating positive reactivity with human tonsil).